Welcome to the #HealYourSelfCare series! Self care is the basis of any healing journey, and is one of the first things we forget — usually when we need it most. These posts will offer you new ways to care for yourself with ritual and sweetness, and be a guide when your brain just won't calm down. Post 3: What are Flower Essences? I've spent the past 5 weeks diving deeply about what self care means for me, my clients, and all of you. There are so many different ways to approach care. Sometimes self care is eating a pizza. Sometimes self care is going on a run. More often than not, it's something we don't do even though we need it. I've already shared a few of my favorite self-care tools. Tarot, flower essences, and being mindful of HALT are the primary ways that I shift out of crazy brain and into prioritizing myself and my needs. Keeping these tools close at hand helps me to relieve the pressure I put on myself to be productive and perfect, and I hope that they will be of use to you, too. But enough about me! Part of this #HealYourSelfCare journey has been learning about what YOU do. I reached out to some of my favorite wellness and witchy leaders to find out how the people I admire prioritize their self care. The tools are varied (though baths seem to be a favorite! ), but the basic key is clear: self care is being kind to ourselves. Want more self-care tips and tricks? 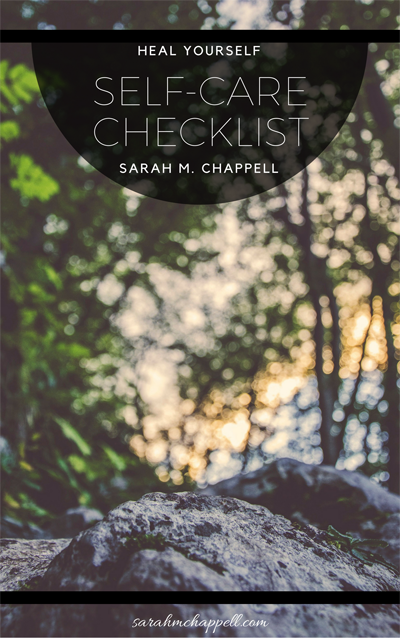 Download your free Self-Care Checklist! You're all set! Check your email for your free Self-Care Checklist download and get to relaxing. With that in mind, I am so pleased to be able to offer you a roundup of self-care rituals from healers, herbalists, and other magical folk in our world. "Currently my favorite self care activity is making myself a ritual bath and then reading Rumi poems till I fall asleep." "I am a very in my head, fiery person, so grounding out is actually my most important self-care practice. Full-body contact with the Earth is at the heart of my personal practical magic, and the Earth-bound medicine tradition I hail from. The daily practices of bare feet on the ground, wild foods in the raw, immersion in bodies of water, and the touch of the bodies of trees larger than myself, reconnect me to the indigenous knowledge of my people and my own purpose in the world." "It is so cliche, but my favorite self care activity is taking a healing bath. It's something I do almost every single day, especially after I see a full day of clients. Sometimes my baths are totally tricked out with flowers, herbs, salts and essential oils, but most of the time, the water itself is enough. It is such a clarifying, nourishing reset for me, and feels like a gift every time I do it. " "The foundation of my self care practice is the nourishment of my nervous system, so that my body can respond with calm and grace to all the stressful sensory stimuli that comes at me every day. The best way to do this is by oiling my body with whole herb-infused oils. My life changed once I started doing this a few times a week! It's especially important for empaths, introverts, and Highly Sensitive People (and kids!). "The biggest thing that has surprised me about stepping into intuitive work is I need WAY WAY WAY more alone time. It’s not just a bonus or a of course everyone needs alone time. No I deeply need alone time to decompress, shut my brain off and not interact. I’m definitely an extrovert and it’s been really hard for me to realize I’m just not as extroverted as I was. I go out and read tarot at events and I love it and it’s awesome fulfilling work. I love meeting a lot of people, and reading for them but….the next day I have to almost be in hiding. I have tried to fight it and make plans, get brunch, whatever, nope. To take care of myself I have to prioritize restorative alone time. " "One of mine seems silly and common, but nature therapy. It's so easy to forget to go to the woods if you're a city dweller. Sometimes you just lose track of time. Just to sit in a green patch for a bit does wonders." "I am so passionate about self care, because it's what's kept me alive. I have anxiety, but anxiety that involves multiple phobias and expresses as agoraphobia, meaning if I'm NOT caring for myself, I can't leave the house. 1. Magic Baths with spell work in the form of herbs, written spells/petitions, incense, and bringing laptop in with me to watch Star Trek. 2. Breathing I make sure that I am constantly, throughout the day, stopping and connecting to my breath. 3. Working with my hands. For me, that's knitting. 4. Being with plants and nature; weekly long walks on dirt, working with herbs in my kitchen, and continually getting to know the ecosystem around me. Now it's your turn! Comment here, post on Instagram using #HealYourSelfCare and share the wisdom of your personal self-care rituals with us. Your tip may be the very thing that someone else needs to hear. How do you prioritize yourself? How do you care for yourself? How do you ensure that you are nurtured and held?